Oh boy, it's good to be back in familiar surroundings. It's amazing what you miss - your own bed is of course the main thing, but little things like bread and milk. Of course there was bread and milk in America, but they're choc-full of preservatives and have unnaturally long shelf lives. They just don't taste the same. The first thing I ate when I got home yesterday morning was marmite on toast :-) I hadn't actually noticed how different the milk tasted in America until I had a glass this morning - I had been avoiding milk for the last month (health reasons) so when I drank some while we were over there it didn't really taste all that different. But my glass of milk this morning? Man, did it taste gooooooooooood. Yep, it's good to be back! We had a lot of fun while we were in Florida. So much to do, so little time! Plus the Round Three sock pattern for Sock Madness had been released - luckily I managed to download it and transfer it to my Kindle before our little mobile data thingee stopped working, otherwise it would've been game over - so I had a pair of socks to try and squeeze some knitting time in for while we were 'touristing'. Anyway, I guess I'll start from where I left off, and work my way through. And we stayed for dinner and a magic show. Unfortunately, I had a wicked head cold that day - everything ached and I felt like crap, so I wasn't overly enthusiastic. But we still had fun. While we were there, a massive thunderstorm rolled in, so we called into the shop on our way out for a bit of retail therapy, and headed back to our accommodation to strip off our soaking wet clothes and get comfy and dry. Later that evening we went to Pirate's Dinner Adventure. The food was... average (although leagues better than the dinner at WonderWorks!)... but the service was great, the show was very entertaining, and there was a lot of audience interaction. All in all a good evening out. Gosh, this post is getting long, and we still have a few days to go. I think I'll leave it here for now, and carry on the tour in another post. Catch you all again soon!! The countdown is on - only six hours before the plane leaves the ground. Ooh, how exciting! I've done everything I possibly can to be ready, all that's left is putting on shoes and locking the door on the way out. I finished the Elizabeth cardigan for my niece. I had to break into a third skein, but have decided to make a pair of fingerless mitts for her as well. It's not likely, but on the off chance that there is still enough left, I'll knit a hat too. 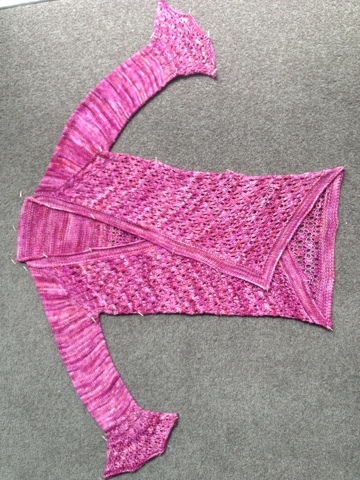 Elizabeth cardigan, knit with Malabrigo Arroyo in English Rose. Lovely. It looks a little weird being blocked, but it will look much better on. I spent five minutes coercing T into putting it on for me, just so I could see what it looked like on a person, but I was so distracted by how awful he looked in pink that I couldn't really tell how it fit. Never mind, I'll get some pics of it on my niece when next I'm down that way. Well, I'm gonna go watch a couple of TV programs On Demand to fill in some time before dinner. I'll try and update while we're over in the US, and if I see a squirrel or a Walmart creature, I'll be sure to get a photo! !